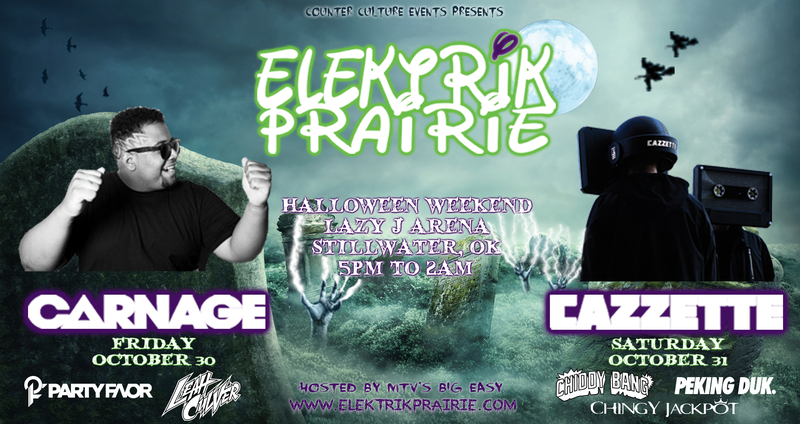 This weekend is Halloween and coming your way is Oklahoma’s only college music experience, Elektrik Prairie. Located in Stillwater at the Lazy J Arena, this 2-day festival will begin All Hallows Eve with “A Night of Carnage” and finish Halloween night with “Freaks, Beaks, & Treats”. The first night will feature Carnage as the headliner, with Party Favor and Leah Culver. Cazzette will headline Halloween night, and performing that night also are Chiddy Bang, Chingy Jackpot, and Peking Duk. Though they have yet to put out an official stage schedule, other performers include Basspeddler, FREE PIZZV, Somxthin Spiritvvl, Travis Traps, and many more listed on their website. Halloween night there will also be a costume contest with a cash prize for the top 3 costumes! This event will be hosted by MTV’s “The Challenge” reality star, Eric “Big Easy” Banks. This festival does not feature camping, but does have shuttles for Elektrik Prairie 2-day pass holders to take them to the arena from 3 different specific pick-up locations between 5pm and 1:30am. Another option, for only $13 for both days, is a priority party shuttle pass, basically like a fast pass to get on the shuttle before regular ticket holders. These party buses are decked out with lights, dancing room, and a sound system to get you pumped before the party even starts. Only a couple more days until the festival and there are limited tickets available. So get yours before they’re gone and we’ll see you there!